* price per person, based on 2 people sharing a room. Single supplement, if applicable: £395. Prices do not include flights. 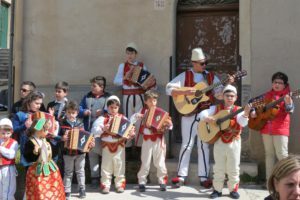 Sicily at Easter and Holy Week is a magical place to be. With the cold months of winter at its back, the weather begins to turn warmer and spring flowers erupt with abundance all over as the island becomes a shimmering green. The weather is still a bit too unsettled for the beach hordes, yet any swimmers brought up in northern climes will find the sea well warm enough for some gorgeous swims. It is also often warm enough for lunches and aperitifs al fresco. 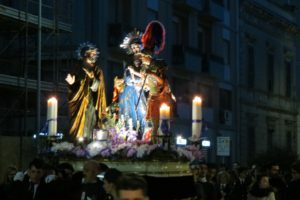 Above all it is at Easter time, more than any other, with Easter processions in Palermo, Trapani and Piana degli Albanesi, that we are reminded of Sicily’s deeply religious, often mystical, convictions. 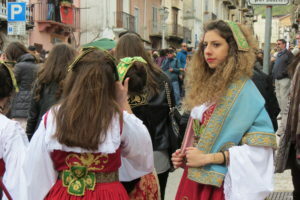 We travel in a small group (maximum twelve people) which we believe is the ideal way to see Easter in Sicily. Evening meal and overnight in Trapani. 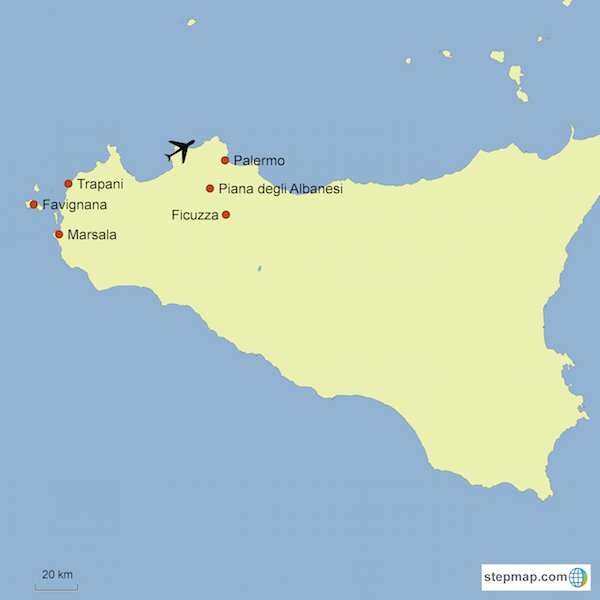 We take the hydrofoil from Trapani to Favignana (30 mins). This beautiful island, an unspoilt paradise which features in some of the Montalbano films, was once the centre of the tuna fishing industry in Sicily. Today it is a pleasant place to while away a gentle couple of hours. We start the day driving south from Trapani to visit the saltpans. Started by the Phoenicians, the salt industry of Trapani became one of the most prolific in the Mediterranean and was crucial to the preservation of the tuna caught off the west coast of Sicily. We continue our drive to Marsala or Marsa Allāh (God’s harbour) as it was known to the Arabs. 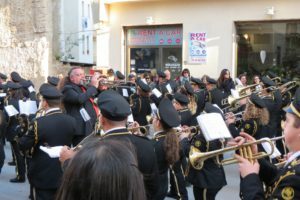 Marsala has earned its place in Italian history books as being the site where Garibaldi landed with his Thousand when he began his conquest of Sicily in 1860. Its history is also entwined with the stories of Nelson, and a handful of English wine merchants throughout the 19th century who made the name of Marsala synonymous with the wine we know today. We visit the Museo Anselmo with its incredible Phoenician ship, discovered in 1971 and retrieved and preserved by a team led by the British underwater archeologist, Honor Frost.After this we will wander through the remains of Roman Marsala to reach the charming Baroque centre. 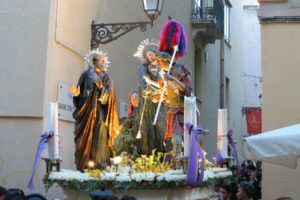 In the afternoon we witness the beautiful spectacle of the living “Via Crucis” as it winds through the streets of Marsala. In the evening we will return to Trapani. Evening meal in Trapani. Overnight in Trapani. With its creeping cobbled alleys, grey stone buildings and silent charm, medieval Erice is quite unlike any other town in Sicily. Built on a hilltop 750m above sea level, it enjoys some splendid views over the salt pans of Trapani, Monte Còfano and Sicily’s western interior. We spend the morning exploring some of its thirty churches and enjoying its medieval atmosphere, before sitting down to lunch. The old town of Trapani has an elegant old centre squeezed between the two sides of the narrow promontory which juts out of the extreme western corner of Sicily. 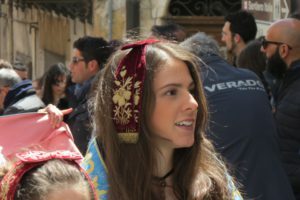 In historical times, Trapani flourished as a Phoenician trading centre and as a port for the hilltop town of Erice, and is still an important port today. 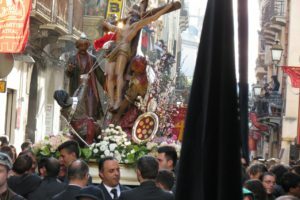 Good Friday in Trapani is embodied in the the astonishing Misteri di Trapani – surely Sicily’s most evocative, sombre and moving of Sicily’s Easter procession. 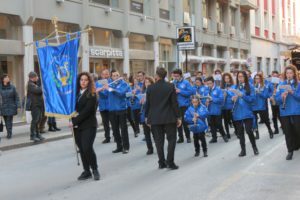 Extraordinary life-sized wooden statues depicting scenes from the Passion of Christ are carried through the streets to the accompaniment of marching bands. We eat in one of the fine restaurants on the sea-front before returning to our hotel. After a late night the previous evening, we treat ourselves to lie-in on Saturday morning. In the late morning, we transfer to Palermo with a stop at Monreale to wonder at its superb Norman cathedral. According to legend, in 1174 the Madonna appeared before the young Norman King William II and led him to a spot where his father had buried a considerable treasure. She instructed him to put it to good use and hence William founded this startling religious monument, high above the fertile Conca d’Oro. One of the greatest extant examples of Norman architecture in the world, it was finished in less than ten years and a bustling medieval village soon sprang up around it. Inside, its spectacular decoration of Byzantine mosaics constitutes quite certainly the most extensive mosaic cycle in the Christian world and makes this cathedral one of the great sights of Italy. Glorious at any time, the cathedral has even more impact than usual at Easter. We start the day with a short drive to Piana degli Albanesi. This fascinating town was founded in the fifteenth century by Albanians in flight from the Turkish invasions. 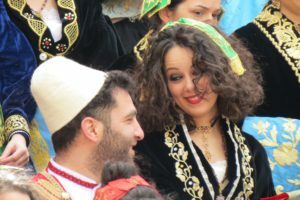 Six centuries later the six thousand inhabitants still follow the ancient Orthodox rite and proudly retain many of their old traditions (signs here are in Albanian as well as in Italian). 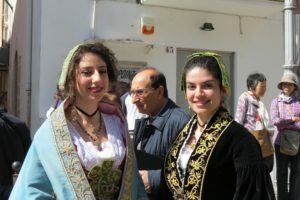 The locals dress in fine traditional costumes for the Easter festivities – black with gold brocade – and the town is full to the brim. 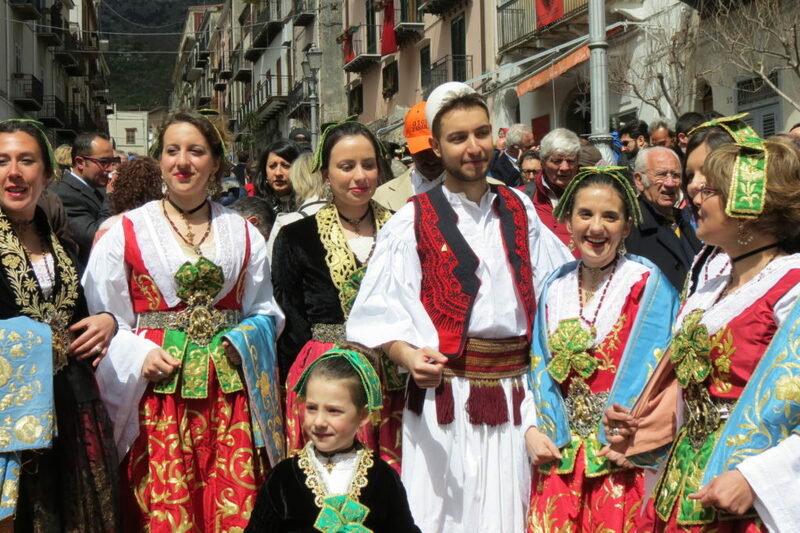 We attend the Easter service in Piana degli Albanesi’s church and then, at the end of mass, join the townspeople filling the streets to witness a colourful parade of beautiful, authentic, Albanian costumes. We have Easter lunch in a restaurant near Piana degli Albanesi. After lunch we pay a visit to the beautiful Bourbon hunting lodge in the nearby woods of Ficuzza before returning to Palermo. Today we spend the whole day exploring the wonders of Palermo. First we visit the the Norman Castle and the incredible Palatine chapel, before going to visit the cathedral. After lunch there will be a chance to visit the Martorana church, the Rosario of Santa Cita (to see the Serpotta stucchi) and also some of the hidden secret gems of Palermo’s backstreets. Evening meal and overnight in Palermo. We have a free morning in Palermo – maybe for a visit to the Palazzo Abatelis art collection, or Palazzo Steri. Or maybe a visit to the city’s vibrant markets. Or perhaps some time to do some last minute shopping. In the afternoon we drive to Palermo airport in time for flights.